Are All Waters Created Equal? 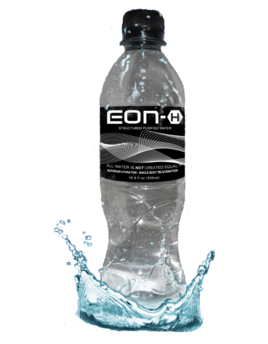 EON - H is dedicated to hydration. Drinking water in any appropriate daily quantity is only helpful if enough of this water is properly absorbed to improve the body's hydration. Many individuals with well established daily water consumption habits often review their water intake levels finding that their daily water consumption totals are sufficient in ounces relative to their total body weight. However, they are still continuing to experience ongoing thirst, dry mouth, countless trips to the lavatory, and feeling not optimally hydrated. They keep drinking without actually significantly improving their state of hydration. At EON - H, we remind everyone that a properly hydrated human body should be at least 65% water, with proper amounts distributed both inside of cell walls, as well as outside of cell walls. We also reinforce the fact that humans can survive food deprivation much longer than water deprivation. As such, properly nourished human bodies need ongoing intake of plain water to assist metabolic processes during sustained vigorous activities. We ask the question: "With so many people drinking so much water (sports drinks, etc. ), why are so many of them still constantly thirsty?" Is All Water Just.. Water? At EON - H, We think not!